Lines of business: The company specializes in intelligence, surveillance and reconnaissance systems, secure communications systems and other high-tech products mainly for the Defense and Homeland Security departments, U.S. intelligence community and aerospace and defense prime contractors. Lines of business: The company is a major provider of IT and engineering services and products, with 85 percent to 90 percent of its business in the defense, intelligence and homeland security areas. Titan's longtime chief Gene Ray will retire when L-3 completes its acquisition later this year. When L-3 Communications Inc. completes its planned $2.65 billion acquisition of Titan Corp. later this year, the high-tech products company will position itself as a significant contender for federal IT contracts, especially those requiring security clearances. Titan is L-3's largest acquisition to date and will make the company the sixth-largest defense contractor in the United States, said Frank Lanza, L-3's chairman and chief executive officer. Lanza held a conference call June 3, the day L-3 announced it had signed a definitive agreement to buy Titan. In the deal, L-3 gets San Diego-based Titan's 12,000 employees, including more than 9,000 with U.S. government security clearances. About 5,000 of them have special, classified clearances that take about two years to get, said Peter Arment, vice president of JSA Research Inc. of Newport, R.I., which provides independent aerospace equity research. That is "strategic in itself," he said. The acquisition also expands L-3's IT business and positions the company well for future growth and government contract awards, said Jon Kutler, chairman and CEO of Jefferies Quarterdeck, a Los Angeles investment bank specializing in aerospace and defense. L-3 expects to build a business in the government IT services sector, Lanza said. "The acquisition is very strategic for L-3, because Titan is a major provider of intelligence services to the Defense Department and key U.S. intelligence agencies," Lanza said. Titan also is a major provider of IT and engineering services and products to the Army, Naval Air Systems Command, Naval Sea Systems Command, Space and Naval Warfare Systems Command, Air Force Electronics Systems Command, Special Operations Command and Northern Command. The deal will push the combined companies into the top 10 of Washington Technology's Top 100 list of federal prime contractors. The company will be able to get prime contracts as a second-tier player, Lanza said. Despite its size, the combined entity still will be chasing after larger prime contractors, one analyst said. The Titan acquisition "makes L-3 a significant player," Arment said. "From a strategic standpoint, they still have room to grow to catch up with the larger prime contractors." A $125 million contract to provide navigation systems to the Navy's Space and Naval Warfare Center. Titan also won a place on the Homeland Security Department's U.S. Visitor and Immigrant Status Indicator Technology contract as a member of Accenture Ltd.'s team. L-3's work for the military, its primary customer, consists mainly of satellite and avionics systems, communications and information security systems, and training simulation and support. "There is little overlap in terms of contracts," Arment said. L-3 is "broadening its contract exposure" with the acquisition. As part of its strategy, L-3 will continue to make additional, small-niche acquisitions valued in the $20 million to $30 million range, but plans to focus on growing the company organically, Lanza said. He added that the Titan acquisition will extend L-3's prime contractor position in getting work from the federal government. Titan also will let L-3 penetrate new client areas as well as expand existing ones, Lanza said, noting that those areas include the FBI, Marine Corps, National Reconnaissance Office, National Security Agency and defense intelligence agencies. The companies are expected to complete the transaction in the second half of 2005 ? possibly by Sept. 30, the end of the third quarter ? pending a vote by Titan's shareholders, regulatory approvals and the settlement of outstanding lawsuits. Under the deal, Titan's shareholders will receive $23.10 in cash for each share of common stock. Titan had 2004 revenue of $2 billion and a net loss of $38.4 million. It is No. 12 on Washington Technology's 2005 Top 100 list of federal prime contractors. L-3 Communications of New York is ranked No. 15 on the list. The company employs 44,200 workers and had 2004 revenue of $6.9 billion, with a profit of $381.9 million. It specializes in providing intelligence, surveillance and reconnaissance systems, secure communications systems and other high-tech products mainly to the Defense and Homeland Security departments, U.S. intelligence community and aerospace and defense prime contractors. L-3 Communications will move Titan's headquarters to its own New York hub, and Titan's longtime chief Gene Ray will retire when L-3 completes its acquisition later this year, Lanza said. Ray had been planning to retire, and Titan started searching for a successor last year. The relocation will not affect Titan's business, Lanza said. He also added that L-3 would not need all of Titan's resources, but did not specify any areas to be cut. Concurrent with the merger agreement, Titan entered into memoranda of understanding to settle securities law class-action and derivative lawsuits pending in both federal and state courts in California and the Delaware Court of Chancery. The settlements will take effect after the merger closes and court approvals are received. In February 2004, the Securities and Exchange Commission and the Justice Department started investigating Titan on allegations that its contractors and overseas subsidiaries paid bribes to foreign governments in exchange for business. Titan later agreed to settle with the government by pleading guilty to three felony charges and paying a $28.5 million penalty under the Foreign Corrupt Practice Act. 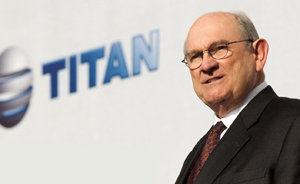 Lockheed Martin Corp. canceled its planned $2.2 billion purchase of Titan in June 2004 because of the then-unresolved investigations of Titan by SEC and Justice. Subsequently, Titan's shareholders filed a class-action lawsuit last year, accusing company executives of concealing the alleged illegal payments to foreign government officials or violating their fiduciary duties by not preventing them. Staff Writer Roseanne Gerin can be reached at rgerin@postnewsweektech.com.